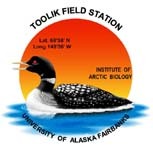 » Tussock Watershed Thaw Depth Survey Summary for 1990 to present, Arctic LTER, Toolik Research Station, Alaska. Starting in 1990 thaw depth has been measured in a small watershed of tussock tundra every July 2nd and August 11th. The UTM stake grid (stakes are in a grid at every 100 meters) was used to locate the points. A ruled stainless steel rod was inserted in non tussock microhabitat until the frozen layer was reached, and the distance was measured to the top of the organic mat (beneath the uppermost moss). Two measurement were made at each point from 1990-1999, and three measurements were made at each point from 2000 on. All measured depths are in cm. Measurements are made within a 20 cm radius of each location point. All the measurements are then averaged into a single value for the day.